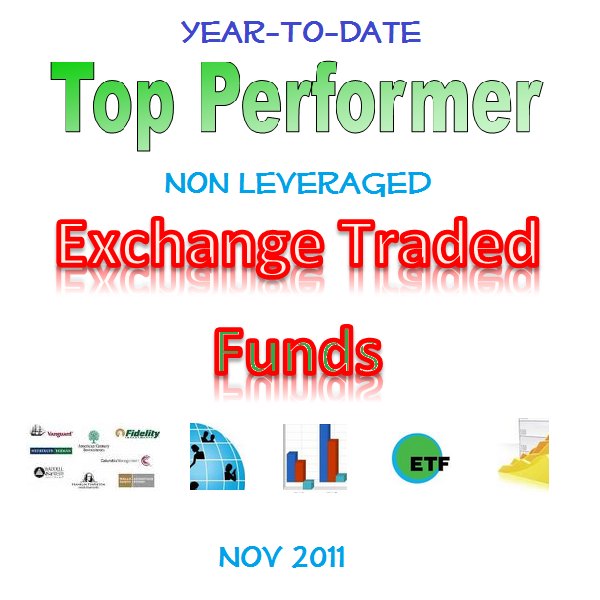 In my previous article, I have provided the list of the YTD Top Performer Mutual Funds of 2011. This list includes non-leverage and leverage Exchange Traded Funds. These non-leverage YTD top performer ETFs may be more desirable for regular investor. The top performers are PIMCO 25+ Year Zero Coupon U.S. Treasury Index, Vanguard Extended Duration Treasury Index ETF, iPath US Treasury 10-year Bull ETN, and more. 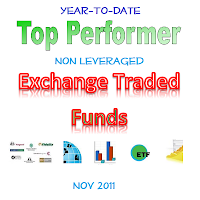 From this list, bond funds and volatility funds are among the top performer for year 2011. This PIMCO 25+ Year Zero Coupon U.S. Treasury Index ETF invests >80% of total assets in the component securities of the BofA Merrill Lynch Long US Treasury Principal STRIPS Index. This ZROZ fund is in the Long Government category. The current dividend yield of this fund is 3.04%. The fund annual expense ratio is 0.15%. It also has 50% annual holdings turnover. Morningstar hasn’t given any rating for this PIMCO fund because it has just been introduced to the market in October 2009. The total net assets of this fund are $59.91 million. The Vanguard Extended Duration Treasury Index ETF objective is to seek to track the performance of an index of extended-duration zero-coupon U.S. Treasury securities. The fund invests majority of assets (>80%) in U.S. Treasury securities held in the index. This top performer bond fund is expected to have a duration that is greater than 20 years. This Vanguard Extended Duration Treasury Index Fund is also in the Long Government category. The fund has total net assets of $627 million. It has dividend yield of 3.17%. As of October 2011, the annual expense ratio is 0.13%. This is comparable to the average in the Long Government category (0.16%). The inception date of this fund is December 6, 2007. This fund has 1-star rating from Morningstar. The fund is currently traded at -1.33% discount from its NAV. The investment objective of iPath US Treasury 10-year Bull ETN is to replicate the performance of the Barclays Capital 10 Year US Treasury Futures Targeted Exposure index. The index seeks to produce returns that track movements in response to an increase or decrease, as applicable, in the yields available to investors purchasing 10-year U.S. Treasury notes. Specifically, the level of the index is designed to increase in response to a decrease in 10-year Treasury note yields and to decrease in response to an increase in 10-year Treasury note yields. This Long Government Bond ETN fund has a 12-month dividend yield of 0%. The annual expense ratio of this DTYL fund is 0.75%. The total net assets of this fund are $4.69 million. This fund was introduced to public in August 2010 and it hasn’t rated by Morningstar yet. This iPath US Treasury Long Bond Bull ETN investment seeks to replicate the performance of the Barclays Capital Long Bond US Treasury Futures Targeted Exposure index. The index seeks to produce returns that track movements in response to an increase or decrease, as applicable, in the yields available to investors purchasing long dated U.S. Treasury bonds. This DLBL is another top performer ETF offered by iPath fund family. It has total net assets of $15.78 million. The fund is also in the Long Government category. This fund has 0.00% dividend yield. This fund has annual expense ratio of 0.75%. This figure is higher compared to the average in the category (0.16%). Since this fund is still new, there is no Morningstar rating yet. The iShares Barclays 20+ Year Treasury Bond fund is seeking investment results that correspond generally to the price and yield performance, before fees and expenses, of the Barclays Capital U.S. 20+ Year Treasury Bond Index. This iShares fund mostly invests >90% of its assets in the bonds of the index and at least 95% of its assets in U.S. government bonds. The underlying index includes all publicly-issued U.S. Treasury securities that have a remaining maturity of greater than or equal to 20 years, are rated investment grade and have $250 million or more of outstanding face value. This exchange traded fund has $3.44 billion total net assets. It has dividend yield of 3.49%. The fund annual expense ratio is 0.15% slightly lower compared to the average in the Long Government category (0.16%). The fund was incepted on July 2002. It has 2-stars rating from Morningstar. The fund average effective duration is 16.96 years. The asset allocation is 99.21% in bond and 0.79% in cash.